For as long as I can remember, caring for animals has been a big part of my life. 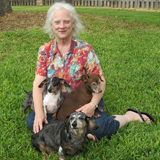 For 16 years, Gentle Hands Pet Sitting has been dedicated to ensure client’s peace of mind, as well as, keeping the pet healthy, safe and happy while the owner is away from home. Certified Dog Masseuse, Administering Meds, and injections.